Spring in the Seattle area is a feast for the eyes. So many plants in bloom! And when one wave of blossoms fades, another begins. We've had over two months of color to enjoy so far this year and we still have the month of May to look forward to. Here are photos of a few of my many favorites at this time of year. 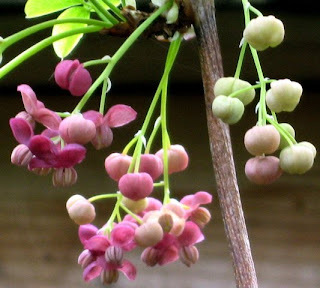 Akebia quinata is an exquisite vine that blooms in early spring. The flowers have a faint clove scent, which is easy to miss because the spring breezes tend to dilute the fragrance. This vine is light and doesn't need much structural support. I grow mine on a rose tower near my front door. This shrub with its distinctive blue-purple flowers, a rare color in the landscape, is Ceanothus. Its common name is California wild lilac, because most species are native to that state. 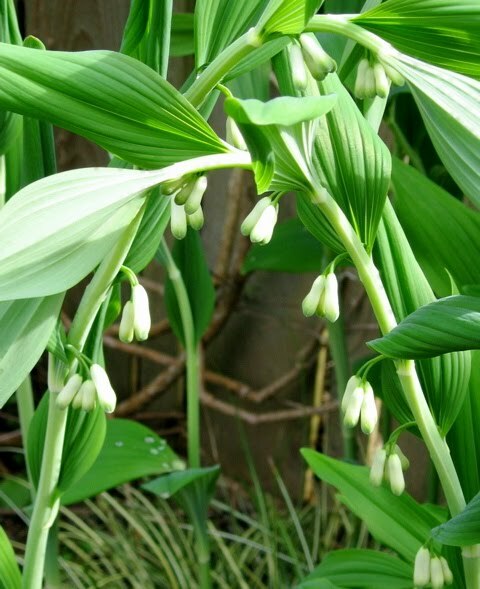 Only a few cultivars of this plant are hardy enough to survive winters in Seattle. 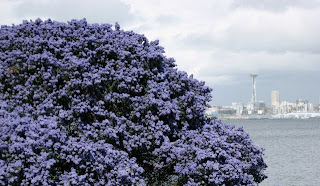 I'm fairly sure this one is C. impressus, which is doing quite well in the park looking across Elliott Bay toward the Space Needle. 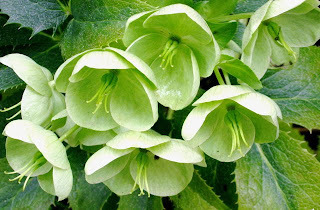 Hellebores add elegance to the garden from winter into spring. This one, the Corsican hellebore (C. argutifolius), blooms early spring. It holds its bloom a long time, unfazed by the pelting rains and strong winds we get with spring storms. I have one planted outside my living room window where I can enjoy it every time I look out. Solomons Seal (Polygonatum odoratum) is an herbaceous perennial, meaning that it dies down in fall. After I've cut away the faded stems in fall, I forget there was ever a plant there. So when it rises up from the ground in early April, its arching stems going from zero to three feet in a matter of a few days, it always seems like a miracle to me. And here are the flowers on one of our native trees, the vine maple (Acer circinatum). These flowers are small and most people don't notice them, but they are lovely to observe opening up just as the leaves begin to emerge. Now it's your turn. What are your favorites in spring?